Given at Rio de Janiero, Brazil on November 21, 1983. May Your Holiness permit us, with an entire filial openness, to submit to you the following considerations. During the last twenty years the situation in the Church is such that it looks like an occupied city. Thousands of members of the clergy, and millions of the faithful, are living in a state of anguish and perplexity because of the "self-destruction of the Church." They are being thrown into confusion and disorder by the errors contained in the documents of the Second Vatican Council, the post-conciliar reforms, and especially the liturgical reforms, the false notions diffused by official documents and by the abuse of power perpetrated by the hierarchy. In these distressing circumstances, many are losing the Faith, charity is becoming cold, and the concept of the true unity of the Church in time and in space is disappearing. In our capacity as bishops of the Holy Catholic Church, successors of the Apostles, our hearts are overwhelmed at the sights throughout the world, by so many souls who are bewildered yet desirous in continuing in the faith and morals which have been defined by the Magisterium of the Church and taught by Her in a constant and universal manner. It seems to us that to remain silent in these circumstances would be to become accomplices to these wicked works (cf. II Jn. 11). That is why we find ourselves obliged to intervene in public before Your Holiness (considering all the measures we have undertaken in private during the last fifteen years have remained ineffectual) in order to denounce the principal causes of this dramatic situation, and to beseech Your Holiness to use his power as Successor of Peter to "confirm your brothers in the Faith" (Luke 22, 32), which has been faithfully handed down to us by Apostolic Tradition. A latitudinarian and ecumenical notion of the Church, divided in its faith, condemned in particular by the Syllabus, No. 18 (Den. 2918). 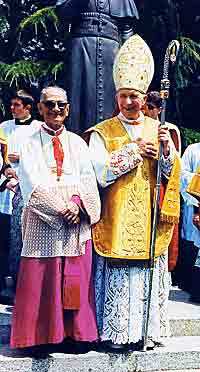 A collegial government and a democratic orientation in the Church, condemned in particular by Vatican Council I (Den. 3055). An erroneous notion of the power of the Pope (cf. Den. 3115). A Protestant notion of the Holy Sacrifice of the Mass and the Sacraments, condemned by the Council of Trent, Session XXII. Finally, and in a general manner, the free spreading of heresies, characterized by the suppression of the Holy Office. The documents containing these errors cause an uneasiness and a disarray, so much the more profound as they come from a source so much the more elevated. The clergy and the faithful most moved by this situation are, moreover, those who are the most attached to the Church, to the authority of the Successor of Peter, and to the traditional Magisterium of the Church. Most Holy Father, it is urgently necessary that this disarray come to an end because the flock is dispersing and the abandoned sheep are following mercenaries. We beseech you, for the good of the Catholic Faith and for the salvation of souls, to reaffirm the truths, contrary to these errors, truths which have been taught for twenty centuries in the Church. It is with the sentiments of St. Paul before St. Peter, when he reproached him for having not followed "the truth of the Gospel (Gal. 2, 11-14), that we are addressing you. His aim was none other than to protect the faith of the flock. St. Robert Bellarmine, expressing on this occasion a general moral principle, states that one must resist the pontiff whose actions would be prejudicial to the salvation of souls (De Rom. Pon., I.2, c.29). Thus it is with the purpose of coming to the aid of Your Holiness that we utter this cry of alarm, rendered all the more urgent by the errors, not to say the heresies, of the new Code of Canon Law and by the ceremonies and addresses on the occasion of the Fifth Centenary of the birth of Luther. Truly, this is the limit! May God come to your aid, Most Holy Father. We are praying without ceasing for you to the Blessed Virgin Mary.